Succeeding the Mountain Maid on Lake Memphremagog, but far grander, was the Lady of the Lake. Built at enormous expense and with considerable trouble, the Lady of the Lake has come to symbolize the heyday of steam navigation on Lake Memphremagog. In fact, the steamer serves as the logo of the City of Newport, Vermont. Construction of the Lady of the Lake took place on two continents and involved dozens of labourers. Her engine and two boilers were built in Montreal, but her hull was manufactured in Scotland and had to be shipped in sections across the Atlantic. Upon arrival, these sections were transported by railway to Sherbrooke, and from Sherbrooke by teams to Magog, where all the parts were finally assembled by crews from Montreal and Scotland. In the steamer’s second season, Sir Hugh Allan hired veteran steamer captain, George Washington Fogg, of the Mountain Maid, to operate his boat. Fogg would captain the steamer until 1884. In 1885, the steamer was purchased by the Connecticut and Passumpsic Rivers Railroad to provide excursion tours to the railway’s passengers who were staying at the Memphremagog House, a luxury hotel in Newport. The steamer made regular trips to Owl’s Head Mountain and other points on the lake. In service until 1915, the Lady of the Lake was towed to Magog in 1917 and scrapped. 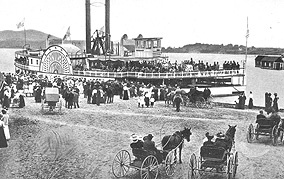 The decline of train travel, big hotels, excursion tours, and the rise of the automobile, ensured that a large steamer like the Lady would not remain profitable -- at least not on a lake the size of Memphremagog. *The Lady of the Lake was licensed to carry 666 passengers in 1914.